NOTE : These leaves are called Amaranth leaves in english. In Andhra we call as Thotakura. This is called Cheera in Malayalam and Chauli ki baaji or chowli in Hindi. 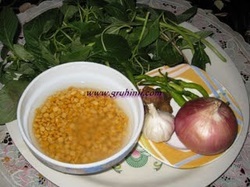 Wash and soak chana dal for 3 to 4 hours. ​Drain the water and grind coarsely adding green chillies, ginger, garlic and salt. Do not add water while grinding. 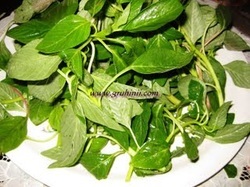 Clean and wash Amaranth leaves thoroughly. 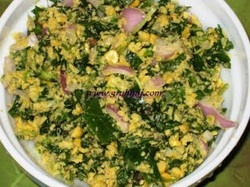 Drain and chop finely.Now combine the chanadal paste with finely chopped amaranth leaves and finely chopped onions. Heat sufficient oil in a pan and deep fry small lemon size balls of the batter. 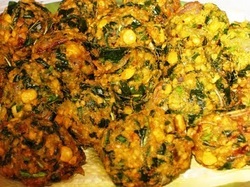 Fry until golden color and serve hot with sauce or any chutney. 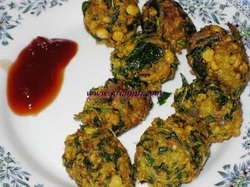 ​Tasty Thotakura vadalu are ready ! !